Sweep away spills with this outdoor all-purpose, non-toxic and environmentally friendly dry clean-up. Easily handles tough spills such as oil, grease and paint. Heavier formula stays down even in slightly windy conditions. Leaves surfaces completely dry and non-slippery. 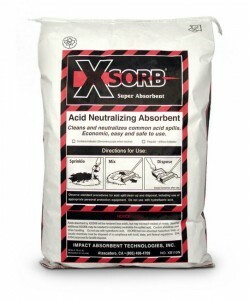 Pound for pound, absorbs 6 times more than clay, saving labor time and money. Not for use with hydrofluoric acid. Absorbs up to 40 quarts. Comes in large 25 lb. easy-open bag. 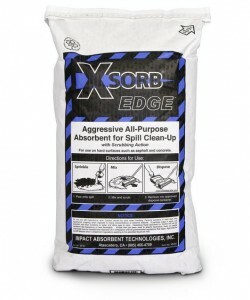 XSORB EDGE Aggressive Absorbent lets you clean up the toughest spills in a hurry, cuts through liquids, lifting them from the surface so you can easily scrub away synthetic oils, petroleum, hydraulic fluids and fuel spills. Leaves asphalt and concrete surfaces clean and dry, not slippery. Decreases disposal costs, saves time and labor costs. As heavy as clay, XSORB™’s aggressive wicking action makes it a superior cleaner. Dark gray color blends with surroundings and leaves no visible white residue. Easy to use and non-toxic to humans or the environment. Not for use with hydrofluoric acid. Exceeds landfill regulations for proper disposal. Applicable for use by raceways, public utilities, industry and more. 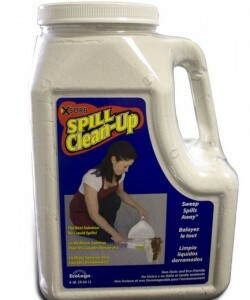 Non-toxic and environmentally friendly formula absorbs liquids on contact, making it easy to simply sweep spills away. 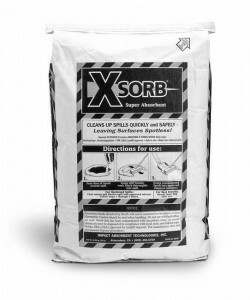 Absorbs all types of liquids and semi-liquids, such as oil, grease, paint and syrup. Leaves floors completely dry and non-slippery, helping prevent slips and falls. FDA approved for use around food. Silica-free product doesn't contain the health hazards associated with breathing in crystalline silica dust present with clay. Fast-wicking material actually soaks up spills, instead of simply becoming coated like clay. Use less, saving labor, inventory and disposal. *Not for use with hydrofluoric acid. Pound for pound, absorbs 7.5 times more than clay. Large 2 cu. ft. /14 lb., easy-open bag absorbs up to 52 quarts. Comes in transparent bottle with easy-to-grip side-handle. When neutralized, simply sweep it up and dispose. Non-toxic, eco-friendly and non-leaching. Meets government regulations for landfill disposal. Absorbs 23 to 30 quarts. Simply sweep up the neutralized spill and dispose of it.Meets governmental regulations for landfill disposal. Non-toxic and safe for the environment. Absorbs 24 to 26 quarts. *Not for use with hydrofluoric acid. Safely absorb all petroleum-based products in the marine environment, including waterways, holding ponds, contaminated barrels, sumps, and more, leaving only clean water behind. Licensed as an oil spill cleanup agent by California Dept. of Fish and Game. Floats and repels water Absorbs four times its weight. 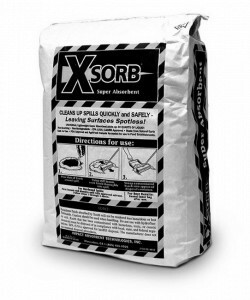 Non-toxic and safe for the environment.Absorbs 22 quarts. 1.75 cu. ft. easy open bag. Non-toxic and environmentally friendly dry clean-up formula absorbs all types of liquids and semi-liquids on contact, making it easy to simply sweep away spills. 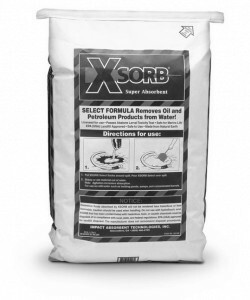 Universal formula easily handles tough spills such as oil, grease, paint and syrup. Leaves floors completely dry and non-slippery, helping prevent slips and falls. FDA approved for use around food. Absorbs 7.5 times more than clay. Saves labor time and money. Not for use with hydrofluoric acid. Absorbs up to 45 quarts. Comes in large 25 lb. box with illustrated directions. 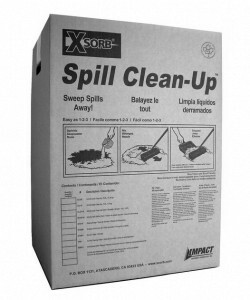 Non-toxic, environmentally friendly dry formula absorbs all types of liquids and semi-liquids on contact, making it easy to simply sweep away spills. Saves time and money by easily cleaning up oil, grease, syrup and sugary liquidsLeaves floors completely dry and non-slippery, preventing slips and falls. FDA approved for use around food. Absorbs 7.5 times more than clay. Absorbs 4 to 5 quarts. Comes in transparent bottle with easy-to-grip side-handle. 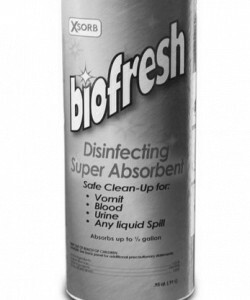 Biofresh easily cleans up biohazard accidents such as vomit, blood and other body fluids while treating the spill with a powerful disinfecting agent. 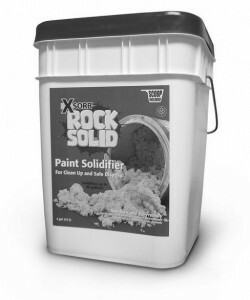 XSORB Rock Solid Paint Solidifier quickly, easily and safely hardens unwanted paint into disposable solid form, making it an environmentally friendly option for disposal -- even acceptable in landfills. Simply add to paint and shake or stir. Paint hardens into a disposable solid within minutes. For use on all latex/acrylic paints. Simplifies disposal and decreases costs. Non-toxic. Solidifies up to 25 gallons of water-based paint. This is simply the best paint hardener on the market today.